This is the other side dish I made for Easter, roasted broccoli topped with cheddar cheese sauce. 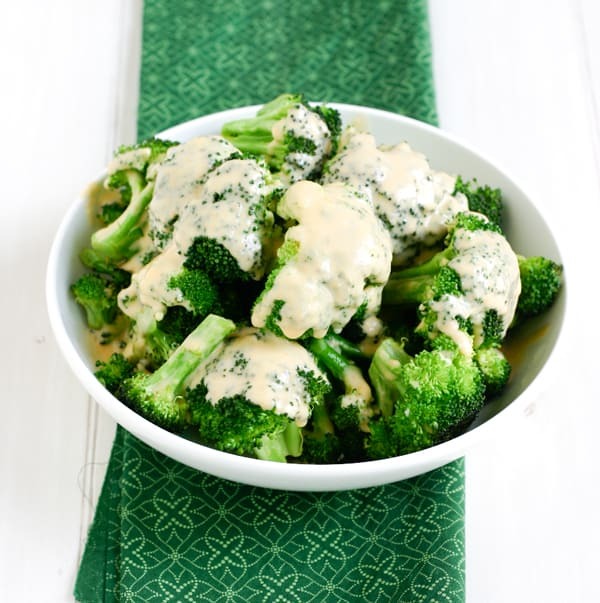 It’s wonderful, and the perfect way to easily dress up boring broccoli. 1. Preheat oven to 400 degrees. Toss broccoli florets, olive oil, and salt together. Spread in a cookie sheet in a single layer. Bake for 15 – 20 minutes, or just until color is vibrant. 2. Melt butter in skillet, and whisk in flour. Add spices. Whisk well and cook for 2 – 3 minutes while constantly whisking. Add milk and bring to a boil while whisking. After it boils, let it thicken and then turn burner off. Add cheese and whisk in to melt, remove from burner and don’t bring to a boil again because it may separate. 3. Spoon over broccoli before serving. Cheese on broccoli is always a fun way to go!